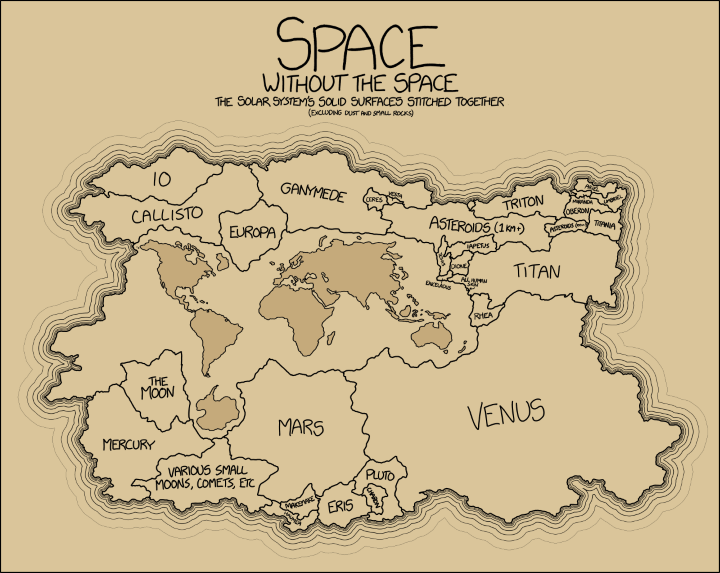 The map above shows the all of the solid surfaces in our solar system stitched together into one giant map. It excludes gas giants, such as Jupiter, since they do not have any solid land but includes moons, asteroids, comets, etc. Various small moons, comets, etc. To support more maps like this, why not buy one of Randall Munroe’s books: Thing Explainer: Complicated Stuff in Simple Words, What If? : Serious Scientific Answers to Absurd Hypothetical Questions, and/or xkcd: volume 0. Where are Jupiter and Neptune? Jupiter’s surface is liquid hydrogen (not solid). Neptune’s surface is water and ice. This is excluding gases, of course.